Colonial-Prospect Lodge No. 24, F.&A.M. We’re back at the Colonial Prospect Lodge for another great night! 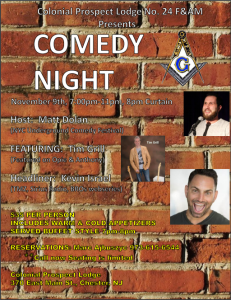 Headlining this show is Kevin Israel l (TMZ, Sirius Radio, BROs webseries), featuring Tim Grill (Featured on Opie and Anthony, opened for Artie Lange) and your host Matt Dolan (NYC Underground Comedy Festival) and special guest Kurt Zimmerman. Hot and cold appetizers will be served buffet style at 7:00pm and the comedians start at 8:00pm. Tickets cost $35 and you can purchase them right here. There will also be a few prizes raffled off at the end of the night. We hope to see everyone there! Don’t forget to tell Facebook you’re going! Check out our listing on NJ Skylands!